When the rain drops from the sky, does your mood drop? "It shouldn’t, looking at what happened at the end of the year due to the persisting Rhine drought, force majeure for all barge operators." A spokeperson from ABL says. For ABL it was an exquisite moment to offer their services. 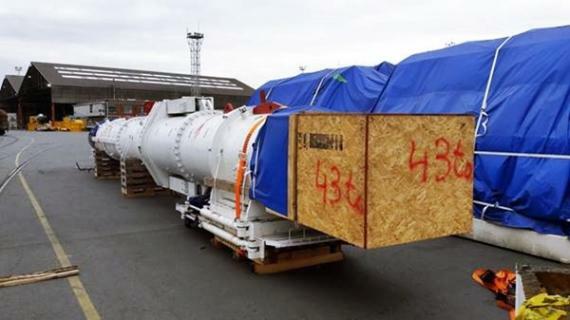 Thanks to their established contacts, ABL managed to arrange for an expedient project delivery of 10 pcs (395 cbm, 370 MT) and 16 containers to Germany. The heaviest unit from the Tunnel Boring Machine (TBM) weighed 137 tonnes! ABL in Belgium has established an excellent reputation for managing project logistics in the Mining and Industrial markets. The company are an industry leader in project freight logistics to the C.I.S., where their experts are involved on a daily basis in project cargo shipments, including major plant and machinery.